SBS 2 has made a late addition to its schedule from Tuesday this week, with US late night talk show, Full Frontal with Samantha Bee. Comedian, writer, actress and political commentator Samantha Bee, was previously a correspondent on The Daily Show with Jon Stewart. The weekly series premiered in the US on TBS in February -all nine of those episodes are available on SBS On Demand. From her encounters with Syrian refugees in Jordan, to her face to face with Donald Trump’s biggest supporters, get up to date with all things Samantha Bee with the first nine episodes, now streaming on SBS On-Demand. 8.00pm Tuesday 26th April SBS 2. Yeeessss, I love this show! 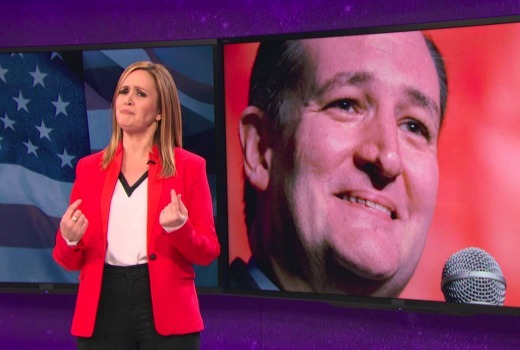 Samantha Bee is awesome. Man, SBS2 gets all the good stuff! Awesome news, been watching segments on You Tube but will be nice to have the whole thing in one bite. So many of the eclectic correspondents from The Daily Show have gone on to do their own thing. It was obviously a supportive environment and a good place to learn the ropes as well as being as incisive and humorous take on US and World politics from a US perspective. Does this late addition mean Brooklyn Nine Nine now airs Wed 8pm from this week instead of the Tues/Wed 8pm it aired last week? Thanks DK. I guess I’ll have to show a bit more patience! Although, this show looks good too so I’ll probably watch this too.